Serving a mission for The Church of Jesus Christ of Latter-day Saints proves to be one of the best decisions of Kenidee Ashford's young life. But losing her mom to cancer while she is on her mission devastates her. Her prayers answered, Kenidee faithfully completes her mission, but new challenges await her when she returns home- a new young stepmother with three unruly children, roadblocks in her career plans, and love where she least expects to find it. 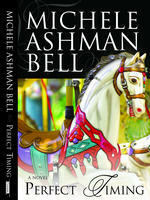 Gifted storyteller, Michelle Ashman Bell weaves a compelling tale of the role of family and friends in helping shape an eternal destiny. Perfect Timing is the perfect read for all those who dare to believe that there is hope after hardship and that dreams actually come true.